Imagine your car is stuck on a dark, lonely road because you have run out of gas. So you go into the trunk, pull out the jack, lift your car, and change out the tires. Is that a good solution to your gas problem? I mention this because the Democrats have a problem. They can’t win elections. The reason is, they don’t address the voters’ real and perceived problems. The higher the GINI Index the greater the distance between the rich and the rest. The graph shows the GINI Index, the measure of financial inequality, has remained stubbornly high, partly because the rich are growing richer while the rest are standing still. In 1998, the real median household income in the United States was $56,510. In 2015 it was $56,516. Allowing for inflation, Americans have made no progress since 1998. Recently, a reader (ejhr2015) called my attention to a speech by Professor Stephanie Kelton, who formerly was an economic advisor to Bernie Sanders and to the Democratic Senate. She is a brilliant economist, Associate Professor of Economics at the University of Missouri-Kansas City. She understands that Federal taxes don’t fund federal spending, the federal government never can run short of dollars, and deficit spending is necessary to grow the economy. Prof. Kelton also is the Director of Graduate Student Research at the Center for Full Employment and Price Stability. And therein lies the problem. Professor Kelton, the one person who truly understands the implications of Monetary Sovereignty, and who also has an influence on Democratic Party policy, is a leader of an organization devoted to full employment and price stability — at a time when unemployment and inflation are low. Unemployment (red) and Inflation (blue) are near historic lows. In short, the Democrats and MMT are busy changing tires, when the car has run out of gas. What is the single biggest problem in America, today? There are many, of course. Drugs, health care, student debt, Social Security, crime, politicians, and immigration are a few. 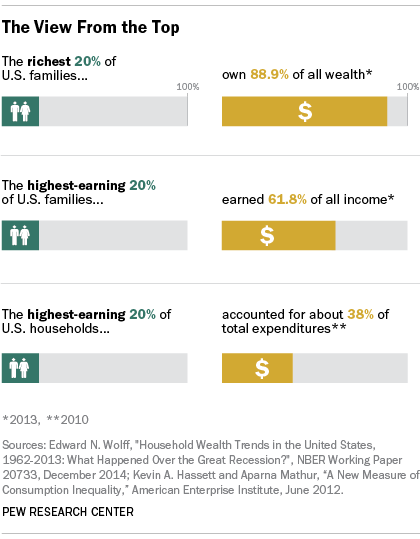 But, I say our worst, real and perceived problem is the widening Gap between the rich and the rest. U.S. employers are churning out jobs unabated as the economic expansion enters its ninth year, but the inability to generate more robust wage growth represents a missing piece in a largely complete labor recovery. U.S. employers added a seasonally adjusted 222,000 jobs in June, the Labor Department said Friday, and the unemployment rate rose slightly to 4.4% with more people actively looking for work. The U.S. has now added jobs for 81 consecutive months. The good news is that even though economists suggest that the U.S. is nearing “full employment,” people are continuing to join the workforce. The bad news is that most workers are still waiting to see meaningful pay raises. So what is the focus of MMT and the Democrats? The non-problems of full employment and inflation. And what does MMT suggest for the Democrats’ platform? A “Jobs Guarantee” of minimum wage jobs — the very last thing the voting public wants or needs. And that is how to lose elections. You live in one of the most progressive states in the union, yet you think more extreme doses of socialism is the answer. Thank god most states, including where I live, are not like Illinois. The nation would be much better off if Illinois left the union. 1. Learn the differences between monetary non-sovereignty and Monetary Sovereignty. 2. Learn what socialism is. Rodger, see these recent articles by Bill Mitchell on jobs. I’d be interested in how they relate to your take. I was able to comment there using my real name [John Doyle] so respondent considered my position. And another on a JG [if you can stick with his 6000 word essays]. In all they summarise a position different from yours. Sorry there is a lot of reading here, but the JG vs a UBI is an important distinction to sort out. You have my admiration for being willing to slog through Billy Mitchell’s abstruse writings. Been there, done that, too weary and old to do it again. So far as I can tell, I previously have addressed the points he has made. I remain convinced that JG is unworkable, naive and useless. UBI is much better, but insufficient. If you feel that in my previous articles I have missed some important JG or UBI point please let me know what it is. Regarding MMT’s Center for Full Employment and Price Stability, we currently have “full employment and price stability,” yet the real problems of our economy have not been touched. The point of this article is that the real problem is the Gap and neither MMT nor the Democrats are addressing it. Ok, Rodger. Do you believe the Gap is fundamental, or consequential? I think it is consequential, an advantage that once seen is kept alive by the rentier class. It’s not framed by macroeconomics but a distortion by mainstream economics. IMO the mainstream is, you could well say, criminal. This is why I have started to see what economics is about, eschewing all the algebraic nonsense that goes on the the fairyland of academia. Bill is a classically trained professor of economics and his 6000 word essays are all geared to the mainstream understanding, being necessary that all sides of an argument are covered. He doesn’t shy away from that. It only takes him an hour to write one! Unfortunately it takes a lot longer to understand them. One respondent, Neil Wilson, on another blog [which you might find interesting] did express an unusual defence of the JG. I’ll see if I can find it. I remember the article. It doesn’t answer my question. I think we can agree on what it is, but that’s not the fundamental I was asking about. Here is another lecture by Stephanie K which directly addresses your arguments regarding a job vs a basic payment. It’s at about the 45 minute mark in the Q&A section. I don’t wish to be discourteous, but with the many publications I read each day and then writing articles, I simply do not have the time to watch speeches or to read long pieces. It would be far better if you could summarize her points, and then I will give you my response. I agree we are being buried in a lot of information. I can’t edit a youtube lecture, but I did say to just go to the middle of it. Drag the curser to say the 40 minute mark and listen to the next 5 minutes. You make such a fuss over the debate re a UBI and a JG, that I think you need to take the time to look at an alternative viewpoint. I’m almost 77 and I wake up every day to over 100 emails. It’s a long day to vet all of them! You make a sterling contribution to the debate just like SK does, but we are on a winning roll now, as the mainstream is owning up to its flaws. 2. By giving them jobs, we make people productive rather than them just sitting around. And your point is that I’ve not addressed these issues? You do realize that she is talking about minimum wage jobs, selected by a government bureaucrat, not by the worker. Right? So she is talking about the job satisfaction and productivity of a person receiving a minimum wage job they did not select, and probably don’t like, but have to take because they couldn’t find the job they want. Do you really think a MacDonalds job would give you “job satisfaction” and increase economic productivity? There are millions of minimum wage jobs out there. Why aren’t they filled? BECAUSE PEOPLE DO NOT WANT MINIMUM WAGE JOBS. Have you ever looked for a job? Would you have accepted a job at MacDonalds? Be honest. JG is a plan only the rich could love, because it does nothing to close the Gap between the rich and the rest. It is the prefect idea to create dependence, so that the 99% will be will to accept slavery rather than starve. And what about all the other problems I have listed with JG in my many posts? Shall we ignore them? MMT suggests JG as the cure for something, I’m not sure what. But what about the Ten Steps to Prosperity? What about eliminating FICA? What about federally funded Medicare for All? Why this MMT focus on JG? For heaven’s sake, unemployment is at a very low level and MMT’s recommendation for economic growth is minimum wage jobs. Doesn’t that strike you as rather foolish? Suggestion for you: Go to point #3 of the Ten Steps to Prosperity, and click the first link, titled: (The JG (Jobs Guarantee) vs the GI (Guaranteed Income) vs the EB (Economic Bonus). Read it and then read the referenced links. You will learn why JG cannot work and will not work. It is a pipe dream by economists who do not understand the business world. Do you honestly believe, after writing a dozen articles about JG that I’ve “not taken the time to look at an alternative viewpoint”? Sorry, YOU say its a “minimum” wage, unless we agree $25/hr is a minimum wage as some are asking, she never said that. I don’t think anyone serious in MMT says that. Maybe our minimum wage here in Oz which is about $15/hr is borderline OK. Mosler says it’s a step up to a real job for those long out of the workforce who need help to re establish the work discipline. Maybe then. If you are right about what you say, then I’m more inclined to agree with you. but it always has to be a living wage. It’s not unaffordable. After all spending creates GDP and more spending more GDP. She also said it’s hard to create inflation. Stupid taxes, like FICA, are all in the firing line already. SK doesn’t have to restate it every time. Neither do you. No her point was that a decent job gives better satisfaction than a handout. At least that’s how it comes across. Why do you have a problem with that? For me personally there are occasions for a UBI but if a JG gives everyone who is looking for a job a decent wage then a UBI would only go to people seriously unable to work, disabled, who need financial lifelines. We already have some of that. It just has to be expanded. I guess you have not read the MMT proposals for JG. Also, you have no read my JG commentaries. If you had, you would know it IS a minimum wage program. The reason: They don’t want JG jobs competing with the private sector for employees, lest the entire nation’s salary level be affected. I have discussed this at length with Professor Randy Wray, one of the primary proponents of JG, and he is very clear that a minimum wage is necessary or the current minimum wage payers would be forced to raise wages, which could have adverse effects on the economy. The Federal minimum wage is $7.25 per hour, though some states pay more. As for FICA, this is not top line for MMT the way JG is. I seldom hear MMTers talk about FICA, though Randy and Warren did have input with Step 1. of the Ten Steps to prosperity. I have no problems with a so-called “decent” job. Apparently, the million+ jobs currently available and unfilled are not decent in the minds of the unemployed. Perhaps the people aren’t desperate enough. Right? That is the whole point. There are plenty of jobs, just not the ones people want. But they are the ones JG will provide. Look in your local paper. Would you accept all the jobs being advertised? What if JG provided the jobs you don’t like — and at minimum wage. Would working in those jobs give you “satisfaction”? Now visualize providing jobs that are appropriate to all the unemployed in every city, town and hamlet in the entire United States of America. Explain to me how you would do that. Now, visualize providing Social Security benefits to everyone. Which is more feasible? One thing that amuses me about MMT: They claim that people would rather have the satisfaction of working for a living, than receiving free benefits, but they also claim if you give people free benefits, they won’t work. Think about the illogic of that contradictory position. When you refer someone to a site — someone who has spent the last 15 years studying a subject — why assume they don’t know the pros and cons? You could have written those two sentences and saved me the trouble. OK, so we go around in circles. For me it has to be a living wage. Like Roosevelt said, if it’s not paying a living wage it’s not a viable business! MMT might indeed have said the minimum but there is also the idea that by spending more people can afford more and prices will be met. It’s all arbitrary anyway. If you earned $100/hr you can afford $10 coffees. for example. Just give the price spiral a kick upstairs. The only reason Wray would have said to pay the bare minimum would have been because MMT was very confronting so there was no point in making it worse with blowing out inflation in the minds of the idiots who make up the mainstream. I bet you he wouldn’t say quite the same today [but you know him. I only know Bill Mitchell, because he’s here]. Anyway SK did not say bare minimum wage. It’s your assumption, but unlikely her’s. It’s not going to work if that’s all that’s offered IMO. They won’t fill the positions, which is what you are saying. They say a UBI won’t work, so we are at an impasse. Bill’s blogs go into details on that, but you want other people to read them to you. No one is doing that for me. “As the first step to restoring full employment, the national government should introduce an open-ended public employment program – a Job Guarantee – that offers a job at a living (minimum) wage to anyone who wants to work but cannot find employment. The Job Guarantee jobs would ‘hire off the bottom’, in the sense that minimum wages are not in competition with the market-sector wage structure. By not competing with the private market, the Job Guarantee would avoid the inflationary tendencies of old-fashioned Keynesianism, which attempted to maintain full capacity utilisation by ‘hiring off the top’ (i.e. making purchases at market prices and competing for resources with all other demand elements). Job Guarantee workers would enjoy stable incomes, and their increased spending would boost confidence throughout the economy and underpin a private-spending recovery. I’m not sure what a “living (minimum) wage” is, though he later describes it as a plain old minimum wage. Perhaps he thinks that by inserting the word “living” he makes the nonsense palatable. Now that you, who never have met Randy Wray, have told me why Wray said what he said, I’ll tell you something else he said: JG is the fundamental belief of MMT. You can’t subscribe to MMT unless you subscribe to JG. I guess that’s why he is a founder of the Center for Full Employment and Price Stability.